If you like golf then the Orihuela Costa and Alicante regions are fantastic locations for the golfing enthusiast and professional player alike. Campoamor Golf Resort, also known as Real Club de Golf Campoamor, is just one of the many courses providing long fairways and well-kept greens. Established back in 1988 this mature golf course offers a great golfing experience for all levels of golfers. As the course is just a few kilometres from the coast you can take advantage of both worlds; relax on the beach before or after your game. The entrance to the golf course is approximately 3km from the N332 at the Aguamarina turning; that's the one near Skala and the Health centre. However, the actual club house to Campoamor Golf Course is about 4.5km. Follow the road from the N332 signposted to Villacosta and Campoamor Golf Resort and you will soon come across the entrance gates. The golf course is mature and surrounded by pine trees and tropical fauna as you would expect from the Spanish coast. However, the fairways are a luscious green and the greens are extremely well kept. 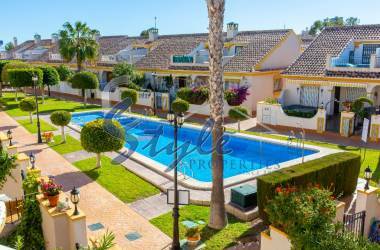 This thriving and mature golf course also has a thriving local community just outside the complex which provides a plethora of bars, restaurants and properties for sale. 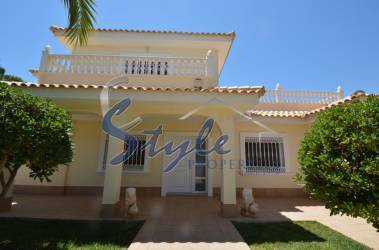 These are independent to the golf resort but compliment the facilities available to the holiday maker or golfer. 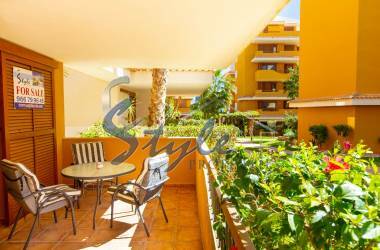 Within the resort you will find a 5 star hotel and spar which has taken a leaf out of La Manga Club by providing a full selection of facilities and amenities. Amongst some of the facilities include tennis courts, 2 football pitches, indoor and outdoor swimming pools, massage and spar treatment areas, a fully equipped gymnasium and one of the best golf courses in the area. The golf course has a fully equipped club house where you can buy golfing equipment, clothing, balls, clubs and golf trollies. 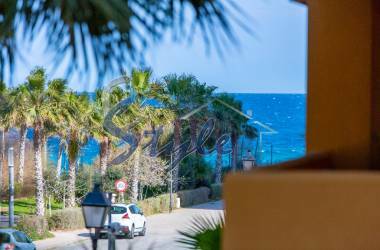 In addition to the golf shop you can sample the delights of the resorts 5 star restaurant or the cafe/bar which serves snakes and refreshments on the terrace overlooking the Mediterranean sea. No golf course would be complete without the use of a golf range and practice areas too. In fact Campoamor Golf Resort has it all. 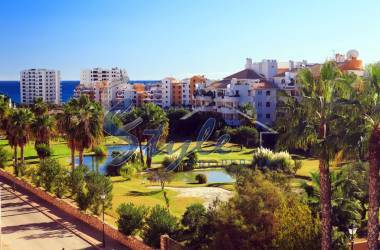 There are actually 3 parts to the hotel accommodation on Campoamor Golf Resort. 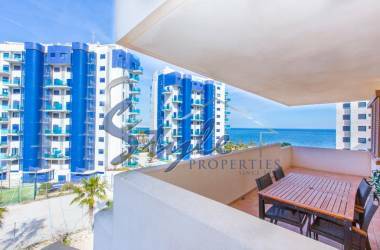 Depending on your requirements you can chose to stay in one of the 5 star hotels or opt for a self-catering luxury apartment. 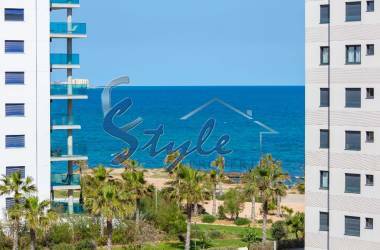 Whichever you choose you will be guaranteed the best quality accommodation in the area. This is the original hotel which commands the highest position on the course grounds and has great views down the valley to the Mediterranean Sea. It opened in 2002 and is located adjacent to the Social Club. As the club house is located within the Hotel building, getting you tee off times and visiting the golf shop is a breeze. This is a new hotel built in 2006 and is located at the entrance to the Sports Zone. This is also where the spar is located. With a fully equipped gym and spar facilities this hotel provides excellent accommodation and relaxation. Ideal for the sports centre and football pitches as well as the indoor and outdoor swimming pools. 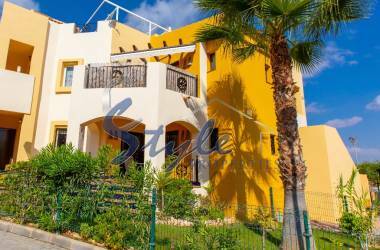 If you want to go more self-catering there are high quality apartments offering a fully equipped kitchen and spacious living areas. 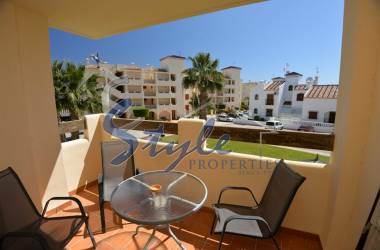 These apartments are also located a little closer to the external shopping and restaurant facilities so if you want to venture out more and experience the local food and drink then these are ideal. As they are self-catering you have the best of both worlds; take advantage of the local restaurants or eat in. As you would expect from a mature and established golf course, Campoamor Golf Resort offers a fantastic golfing experience. However, Campoamor Golf Resort offers more than just golf; also available to you is over 100'000m2 of sports facilities which have been specifically designed to cater for all tastes and requirements. You can enjoy tennis, paddle, soccer, cricket and the fully equipped gym and spar. The Spar offers that great opportunity to relax those tired legs and muscles. Relax in the Jacuzzis or the heated pools while looking over the soccer pitches and sports complex. 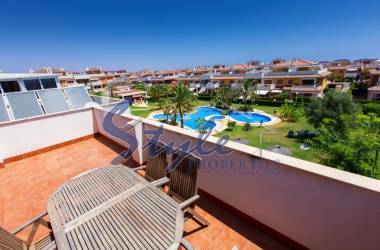 There are 2 outdoor pools within the sports complex areas and a number of other pools which are shared by the properties within the Campoamor Golf Resort. 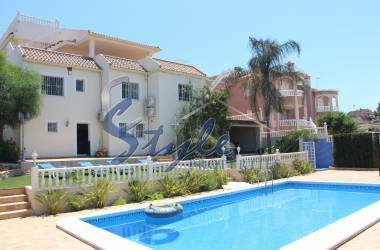 There is also an indoor heated pool and beach area. To complement the facilities you can employ one of the fully trained sports masseurs. Just outside the resort you will find the new shopping centre called La Fuente. La Fuente shopping centre is full of all sorts of shops and bars as well as convenience stores including a chemist. 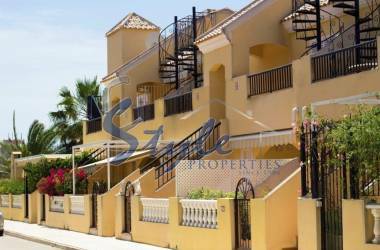 Apart from La Fuente there are many other commercial areas and facilities which cater for all tastes; traditional Spanish bars offering tapas and fine dining as well as snack bars, theme bars, restaurants of all type of cuisine. You can shop in any number of the small convenience stores or you can venture into Mercadona which tends to provide the best mainstream shopping popular with Spanish and Expats alike. 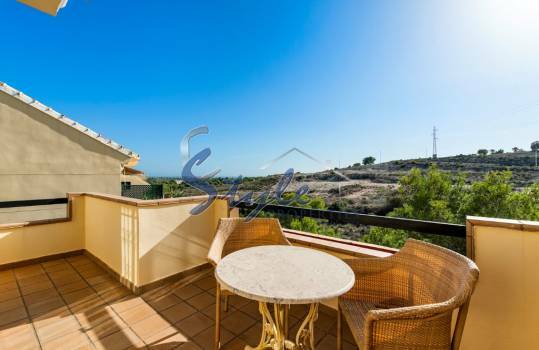 Living on a golf course has its advantages and Campoamor Golf Resort is no exception to this. 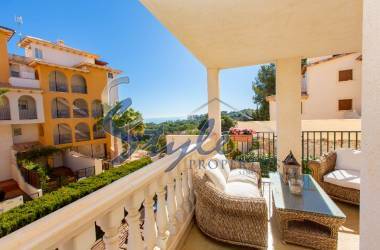 The properties for sale on Campoamor Golf Resort vary and will suit all budgets and requirements. 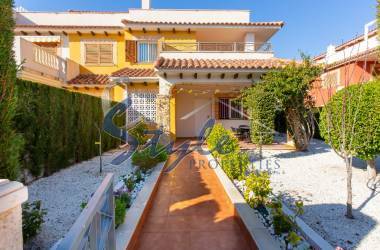 If you are looking to buy a luxurious detached villa with front line aspects to the fairways then you would certainly not be disappointed with property we have for sale on Campoamor Golf. 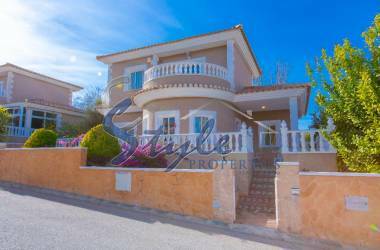 However, these exclusive properties are not widely available so you should contact us to search for your ideal property. 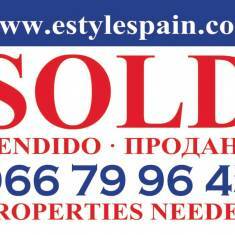 If you are looking to buy a smaller terraced or semi-detached property on the golf course then there are more options available to you. 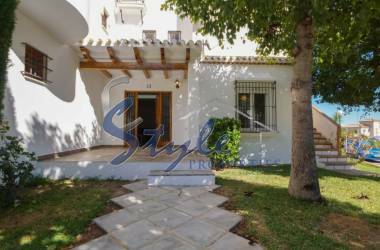 Some very nice properties are the Granada type terraced properties. These often surround their own private communal swimming pool, only shared by the few properties which surround it. Having many communal pools dedicated for the use of just a few properties means the pools are never very busy and sunbathing in the grassed areas around the pool is relaxing without a fight to find a perfect spot. 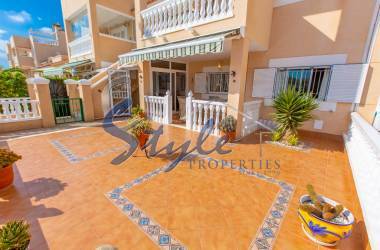 There are also some very nice maisonettes type properties on Campoamor Golf Resort which are on 2 stories. 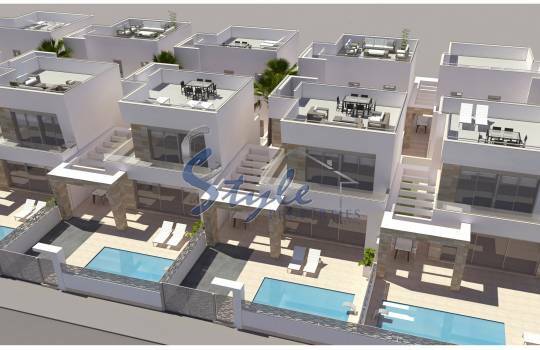 The make ideal places to live or spend your holiday and they are bright modern and airy. 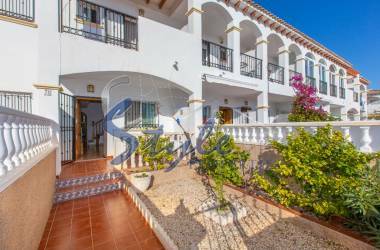 The upper floor maisonettes have a large vaulted ceiling, large spacious rooms and many have lovely views over the resort and some have sea views. 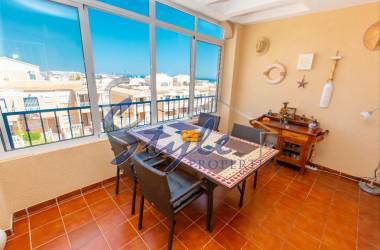 There are many types of apartments for sale in Campoamor Golf, all of which are modern and of a high standard but they also provide much more space than most apartments in the area. 2 and 3 bedroom apartments offer large open plan lounge dining rooms as well as separate kitchens and utility rooms. 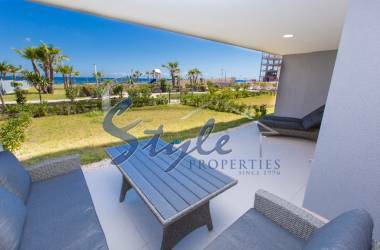 Access to the terraces is via a patio door and the terraces are big enough to have a table and chairs so you can enjoy al fresco dining. Many also include a build in BBQ. Playing Golf on Campoamor Golf Resort The course itself is fairly forgiving, with its long and wide fairways and smooth well-kept greens. It's a full 18 hols which are well maintained and great for all abilities. Slightly raised tee and ideal to start your game. Consisting of a straight line to the green, experienced players can easily finish this in two strokes. Slightly raised tee with the hole closer than it appears. A good first stroke at the tee will reward the golfer with a second on a short iron, ensuring that the bunkers do not enter into the game. This is a great par 4 but you will need a good tee off to ensure your second shot can clear the bunkers. This is quite a long par 3 at 195m but the raised tee gives an ideal sight of the green. Its very easy to lose the ball to the right and overall this is a difficult par 3. To be in with a chance with this hole you will need a good tee shot. The fairway drops away so you will not be able to see the landing spot. The dog leg to the right can cause some golfers issues but a good position on the fairway will make access to the protected green more easy. A lovely little par 3 but beware the green is well protected by bunkers. A long par 5 which requires 3 good strokes to see you in line for par. And watch out for the water! This can create problems if you don't keep away from the water which runs along the left of the fairway crossing just before the front of the green. This is the most difficult hole on the golf course as it requires a great shot from the tee. The fairway slops from right to left and there is a water hazard about 2/3 up the fairway. This is another long par 3 with a well protected green. This short par 4 hole has a slight dog leg to the right and a very well protected green. A strong shot can reach the green but the less able should play it safe to the left of the fairway so your approach to the green is easier. Quite a long hole with a slight bend to the right but you will have to keep left from the tee to avoid the lateral obstacle then your 3rd shot should be taken with a short iron to the raised green. A fairly straightforward par 4 which has been recently restructured. You will need a long iron to reach the narrow green. This par 4 has a slight dog leg to the right. Your tee shot will be blinded slightly too so a mid iron is recommended with a second iron to the green. Looks can be deceiving here as you might be tempted to take a drive to the green but beware the fairway is not as long as you think. A good player should be able to take 2 strokes to reach the green but the split level green can cause some problems. Careful! You tee off over water and the green is a very slight dog leg to the right. This hole is also the signature hole of the course. This is a long hole which requires several good drives to ensure you will reach the green to obtain par. Watch out for the water hazard to the left of the green. Go ahead and relax in the bar. Reminisce about that shot which was just fantastic or the one which you just could not find! Either way the Campoamor Golf Course will reward you with fond memories which you will want to repeat time and time again.